Tomorrow is Chinese New Year, and this new year is a Year of the Dog. So, we thought, it was the perfect opportunity to chat about OUR dogs, our WILD DOGS! One of the things that we love about Sand Rivers are those fantastic African wild dogs! Such rare animals to see in East Africa but Selous Game Reserve is for sure the place to spot them! And here we are with a pack of 24 of them on the hunt for a wildebeest. It was amazing! Especially when the action unfolded as they had to chase off some pesky hyenas wanting to steal their share of the kill. 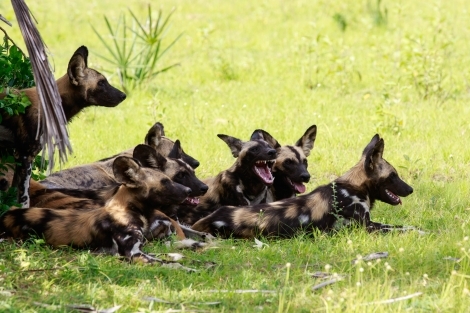 African wild dogs or African painted dogs are among the most successful social hunters in Africa. Always seemingly on the run. They have dagger-like teeth, designed for eating meat, and when hunting prey, their bodies cool down remarkably quickly after running as fast as 37 miles per hour (60 km/p/h). 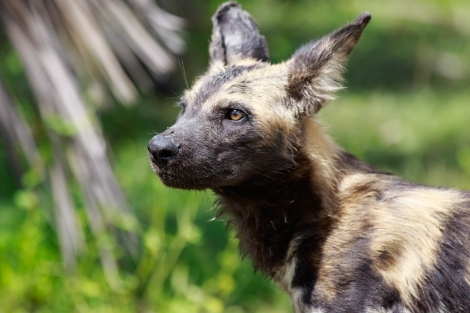 They are called painted dogs for the combination of black, tan, and white blotches across their bodies. Wonderful. Each animal has a distinct pattern, but all have black faces and ears, tan foreheads, and white-tipped tails. Packs are made up of relatives. All members help rear pups born to the dominant male and female. The packs, which average 9 to 10 adults plus juveniles, are extremely social. So, witnessing a pack of 24 is such a rare thing! Both males and females leave the pack where they were born, but males tend to disperse a year after females and travel farther to new territories. Females in the pack are closely related to each other, as are the males to each other usually. However, males and females in the pack are not closely related to each other. A pack’s average territory is about 234 square miles (606 km2), but varies based on how much prey lives in the area. 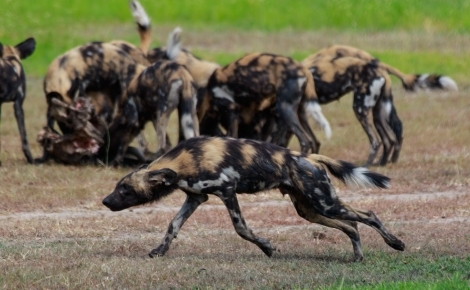 African wild dogs aggressively defend their territory against unrelated neighbors and will fight intruders to the death. As you can see, they need a vast territory and unfortunately the decline of these populations is ongoing, due to habitat fragmentation, human persecution, and disease outbreaks. We are so delighted to still have the opportunity to witness them here, we take every moment with joy! !